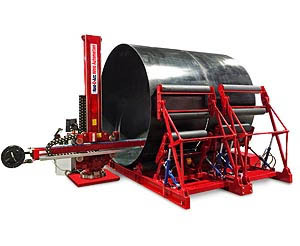 MacAljon, a industrial general contracting firm in the US, has increased the productivity of its thin-wall tank manufacturing operation by more than 50% using the Red-D-Arc RDA MFUB-TW (fit-up bed for thin-wall cans). Fit-up time has been decreased by 20% and the use of spider bracing is no longer required. With no spider bracing to get in the way, a manipulator is now used to perform SAW ID circumference welding which has increased productivity by 30%. 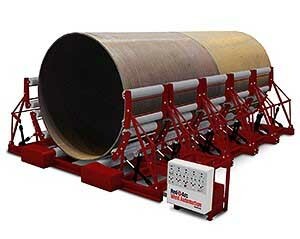 The RDA MFUB-TW system is specially designed for the construction of thin-wall vessels ranging in size from 3 m to 4.7 m in diameter (custom sizes are available). Our patented system is fitted with independently-adjustable vertical-rolls to support, align and compensate for tank non-concentricity when assembling multiple thin-wall sections which eliminates the need for spider bracing. 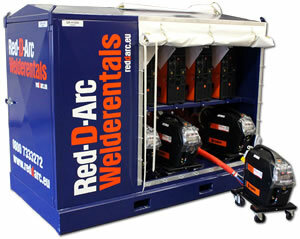 If you work with vessels that require the use of spider bracing or that have a wall thickness of between 4.8 mm – 9.5 mm contact the Red-D-Arc sales team to learn more about the RDA MFUB-TW and how it can increase the productivity of your thin-wall tank manufacturing operation.